In the midst of Africa’s poaching crisis, a dedicated group of aviators may have uncovered a solution to ending this illegal practice. Air Shepherd, an initiative of the Lindbergh Foundation, is flying advanced unmanned aerial vehicles (UAVs) in high-risk areas in South Africa — and soon, other countries on the continent. Air Shepherd’s UAVs, equipped with coaxial daytime and infrared cameras, transmit live footage to a control and command vehicle on the ground, allowing Air Shepherd staff to monitor at-risk wildlife from a safe distance and report suspicious activity to park rangers, who can then move in and arrest the poachers. One of the most lucrative criminal operations in the world, the illegal wildlife trade is driving iconic African wildlife, including rhinos and elephants, to near extinction. But when word spreads that Air Shepherd’s UAVs are flying, poaching activity virtually ceases, says John Petersen, chairman of the Lindbergh Foundation. “There’s a huge deterrent effect. All you have to do is catch one or two poachers and suddenly the word gets out,” he says. Petersen formed the idea of Air Shepherd about three and a half years ago after speaking with a pilot from the Kenya Wildlife Service. The Lindbergh Foundation, established to further Charles and Anne Morrow Lindbergh’s environmental causes, had provided the organization with two airplanes and night-vision goggles, but flying manned aircraft in the bush was becoming increasingly risky. “I was talking to a pilot from the Kenya Wildlife Service and he said poachers had shot at one of the airplanes. Separately, one of the other pilots had crashed an airplane and been injured,” Petersen says. “More than that, the rangers owned the daytime, and the poachers owned the night.” Without navaids or instrument ratings, nighttime flying is not a safe option for pilots in the area, Petersen says. 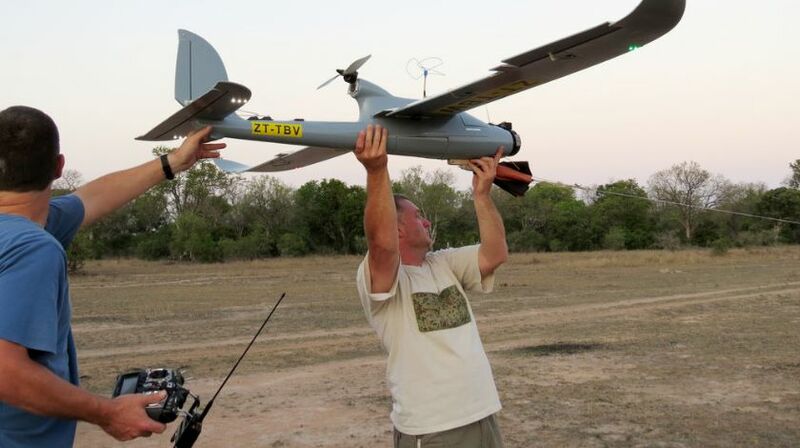 Although the Kenya Wildlife Service didn’t jump at the idea, the Lindbergh Foundation teamed up with UAV and Drone Solutions (UDS), a South Africa-based developer of unmanned aerial vehicle systems, to form a joint venture. For six months, UDS tested and refined the design of its UAV, developed specifically to fly anti-poaching missions. During that period of time, not one rhino was killed in areas where 15 or 18 were killed each month for the past two years. Since the initial testing, Air Shepherd has assembled two on-the-ground teams that fly UAVs in Kruger National Park and in Kwazulu Natal every night. The pilots, licensed as commercial airline pilots, were the first licensed UAV pilots in South Africa. Their command and control vehicles feature a telescoping mast with two antennas, which track the UAV’s location and capture video; three large screens that display moving maps and live video feeds; and a 3-D printer. UDS managing director Otto Werdmuller Von Elgg says that BatHawk, the UAV created specifically for anti-poaching missions, was designed to crash well. “We’re basically on the edge, and we do take risks when landing,” he says. After all, the BatHawk is flying in the bush at night, beyond line of sight. Depending on its payload, the BatHawk is capable of four hours of continuous flight and can operate up to 40 kilometers from the command and control vehicle. The teams coordinate with park rangers to locate the most high-risk areas to survey by UAV. Because the park rangers know where the animals tend to congregate, they can predict where the poachers are likely to be. Petersen says their UAVs typically operate near roadways, as about 85 percent of poaching takes place within 150 yards of roads. But even if Air Shepherd hasn’t targeted the correct areas on a given night, he says, their presence is enough to ward off poachers. “The ‘jungle telegraph,’ as they call it, picks up the message and spreads it all over,” he says. And because the UAVs typically operate at an altitude of 300 feet, they cannot be seen or heard. Air Shepherd’s ongoing efforts to fight poaching with aviation technology further Charles and Anne Lindbergh’s shared vision to utilize technology for environmental preservation, says Petersen. “They flew over the planet in ways no one ever had before, and over time they saw the changes that human developments were making on the surface and became concerned. So in a sense, they were some of the world’s first environmentalists,” Petersen said. Through ongoing initiatives, which will soon spread to Zimbabwe, Malawi and Zambia, Air Shepherd continues to find that balance.